English conductor and composer; born at Kingston, Jamaica, Jan 29, 1852; at the age of four he was taken to England. From his earliest years he enjoyed exceptional advantages in being brought into contact with the greatest artists during his father's treasurership to Her Majesty's and Drury Lane theaters. At the age of eight he had composed the music of an operetta entitled "Garibaldi"; and, studying under Sir Julius Benedict and Sir John Goss, on reaching his twelfth year he was thoroughly at home in Beethoven's sonatas. Cowen made his first appearance in public at the age of eleven, in the concert-room of Her Majesty's Theater; and the following year the young musician gave a concert at Dudley House, at which Trebelli, Joachim, and Santley assisted. When fourteen years old he left for Leipsic to enter the Conservatory; and there he studied under Reinecke, Moscheles, and Moritz Hauptmann. Returning to London, he gave several matinées at Dudley House, and then proceeded to Berlin to resume his studies. Among his more popular early works were the cantata "The Rose maiden," 1870; "The Language of Flowers"; and the "Scandinavian Symphony," 1880. From 1871 to 1877 Cowen accompanied Her Majesty's Opera; he was conductor of the Covent Garden promenade concerts, 1880; of the Philharmonic concerts, 1888-92; and was specially summoned to Australia as conductor of the Melbourne Centennial Exhibition, 1888-89. Later he was appointed to succeed the late Sir Charles Hallé in the conductorship of the Manchester, Liverpool, and Bradford concerts, 1896. 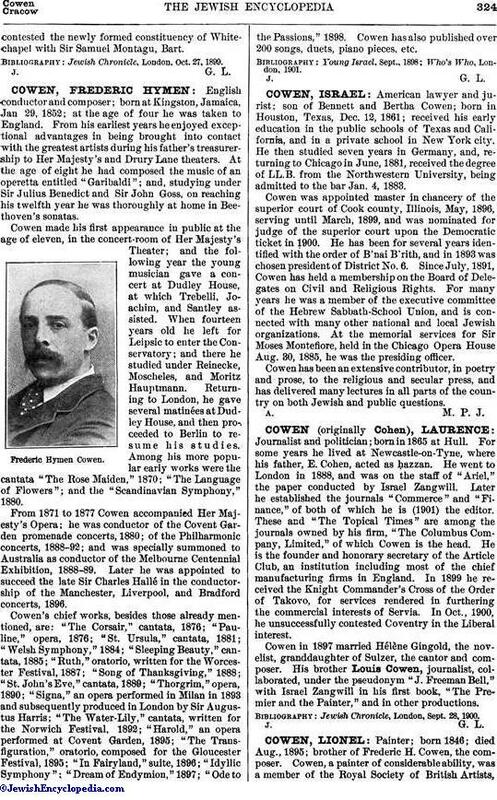 Cowen's chief works, besides those already mentioned, are: "The Corsair," cantata, 1876; "Pauline," opera, 1876; "St. Ursula," cantata, 1881; "Welsh Symphony," 1884; " Sleeping Beauty," cantata, 1885; "Ruth," oratorio, written for the Worcester Festival, 1887; "Song of Thanksgiving," 1888; "St. John's Eve," cantata, 1889; "Thorgrim," opera, 1890; "Signa," an opera performed in Milan in 1893 and subsequently produced in London by Sir Augustus Harris; "The Water-Lily," cantata, written for the Norwich Festival, 1892; "Harold," an opera performed at Covent Garden, 1895; "The Transfiguration," oratorio, composed for the Gloucester Festival, 1895; "In Fairyland," suite, 1896; "Idyllic Symphony": "Dream of Endymion," 1897; "Ode to the Passions," 1898. Cowen has also published over 200 songs, duets, piano pieces, etc.